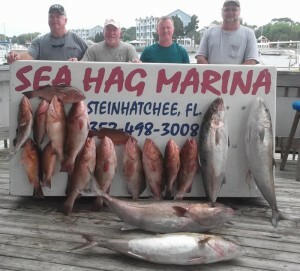 Fishing really picked up this month. 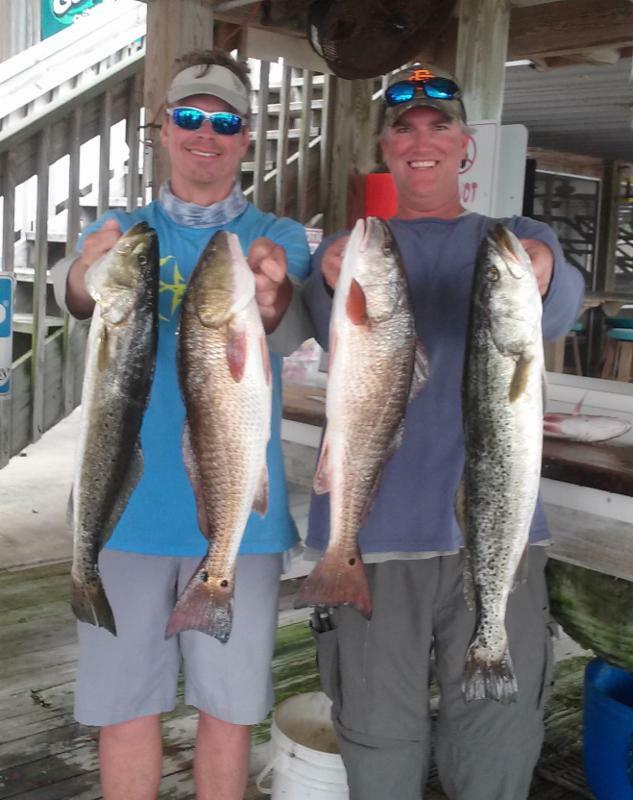 Water temperatures are up near 70 degrees, inshore fish are hitting topwater lures, redfish are schooling, and inshore, all is good. Near the end of the month for unclear reasons the bite dropped off a bit for trout, while the redfish bite was consistent throughout the month. 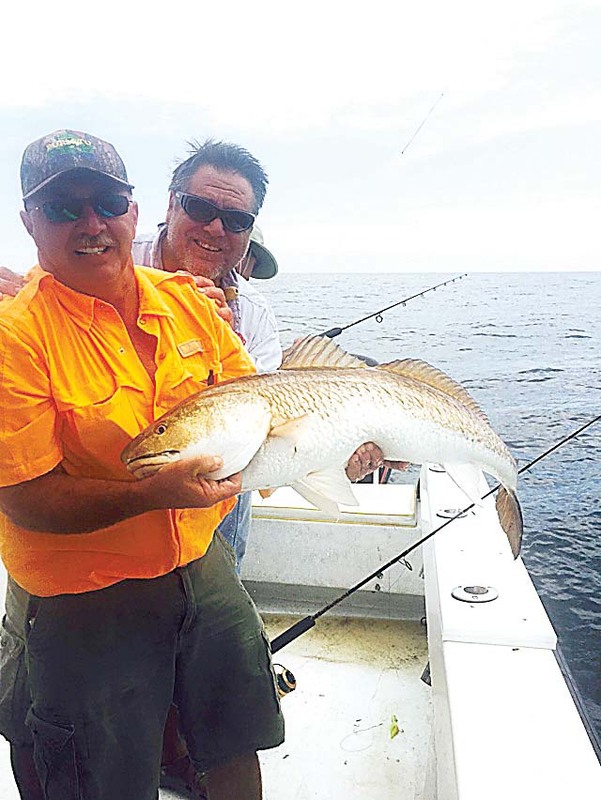 While there were some excellent gator trout being taken (see this month’s pictures), the schools of keeper trout haven’t repopulated the flats yet. 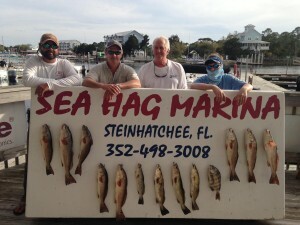 Around mid-month we finally had an explosion of pinfish on the flats, and mullet are moving in the shallows. During the last week I saw large schools of small whitebait and guides began catching some large Spanish mackerel near the offshore bars. Those are sure signs of the northward migration of baitfish and pelagics into our area. 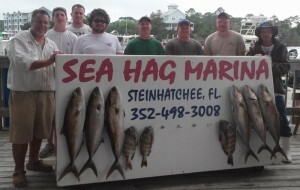 Offshore, people were hauling in some huge amberjacks and releasing some nice gag grouper. Red grouper were harder to find (of course, since there is no season on red grouper) but long-distance trips brought in some great catches. The sheepshead bite has been a little puzzling, in that there have been some fine catches but there don’t seem to be as many fish as some previous years. It’s possible that the large females haven’t actually arrived at the spawning areas yet in large numbers. Hopefully the relatively unregulated limits of fifteen fish per person will continue to support this fishery. 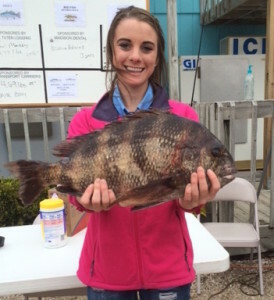 Here are some pictures from this month, including some from several big tournaments that were held in March. I had an amazing redfish day with Doug Barrett- 17 redfish between 23 and 28 inches in an hour. School is fun. John Price with a 30 incher taken on a topwater. Chase Norwood with a giant trout on a creek fishing trip. Michael Aman from Perry took first place in the Special Olympics Tournament with this 5.6 pound trout. Frank Sheffield, Dean Baker, Terry Gaines, and Glen Corbett from Starke found this great catch of red grouper and very large amberjack. Friend Mark McKinney from Gainesville nailed this overslot redfish on a topwater. Don Campbell and Robbie Brooks with the winning 6.2 pound trout in the Steinhatchee Community Tournament. The amazing Jeff and Debbie Evans….one of those redfish was a prize-winner at 6.4 pounds. Kristina Pekarek with a 7.1 pound sheepshead. Kristin Griffis with a beautiful cold weather redfish. 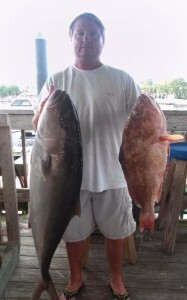 Cephas Christian from Orlando with a fine amberjack/red grouper duo. Greg Hause from Alachua with part of his excellent catch. 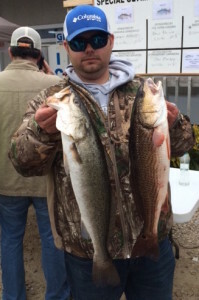 Kyle Blue from Perry with a 4.5 pound trout and a 3.7 pound redfish. Alan Folsom from Valdosta with one of many sheepshead his family brought to the cleaning table. Bryan Perry and Jason Carrington with a red and a trout each. 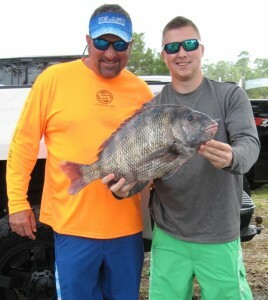 Connor Thomas and Eli Jenson from Jacksonville caught the largest sheepshead in the Community Tournament. Gag grouper are open in April, May and June….but only in state waters in three counties, and in our area, there aren’t a lot of gags inside of nine miles. 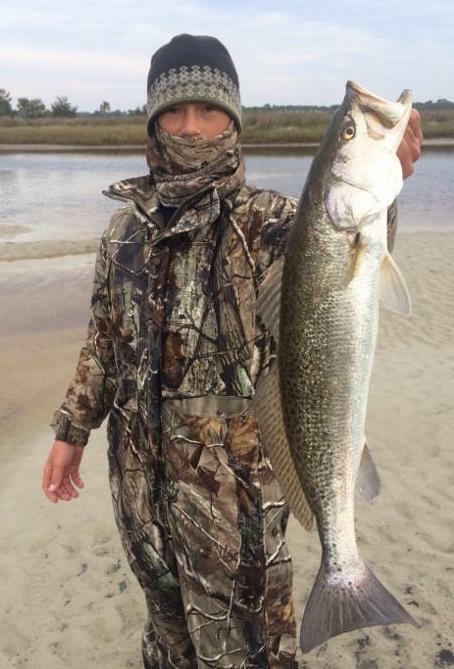 However, there are some areas with structure in close, so if you have any shallow water numbers, this is the time to use them, as long as you go north when you come out of the river (Taylor County has an open season, while Dixie County (everything on the south side of the river) is closed. 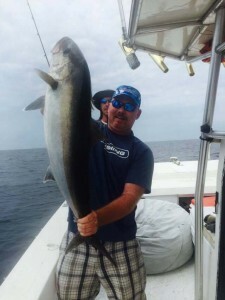 Red grouper and amberjack remain open. This month we can look forward to kingfish, Spanish mackerel and cobia moving into our area. Sheepshead will be around for most of the month, generally around rockpiles in 15 to 40 feet of water. 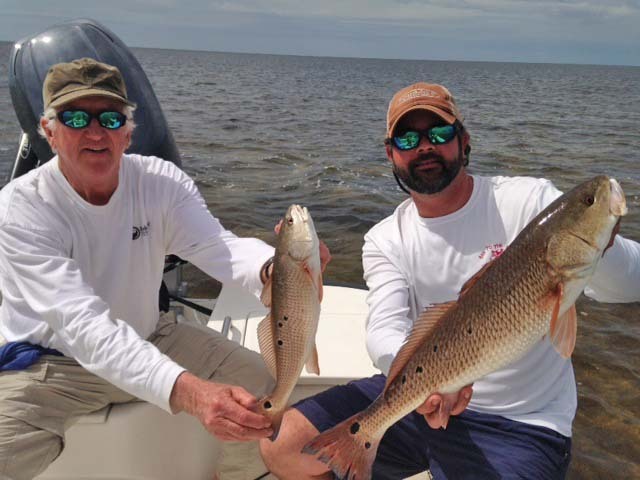 Inshore, redfish are schooling, generally within a quarter mile from the shoreline, and moving right into the grasslines on flood tides. 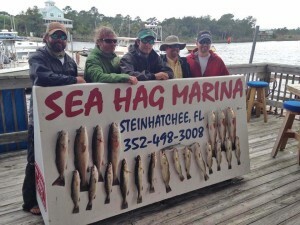 Fish suspending lures such as the Live Target scaled sardine or topwaters like the Rapala Skitterwalk or Heddon SuperSpook Junior to cover as much water as possible, and as always, look for schools of mullet or whitebait. 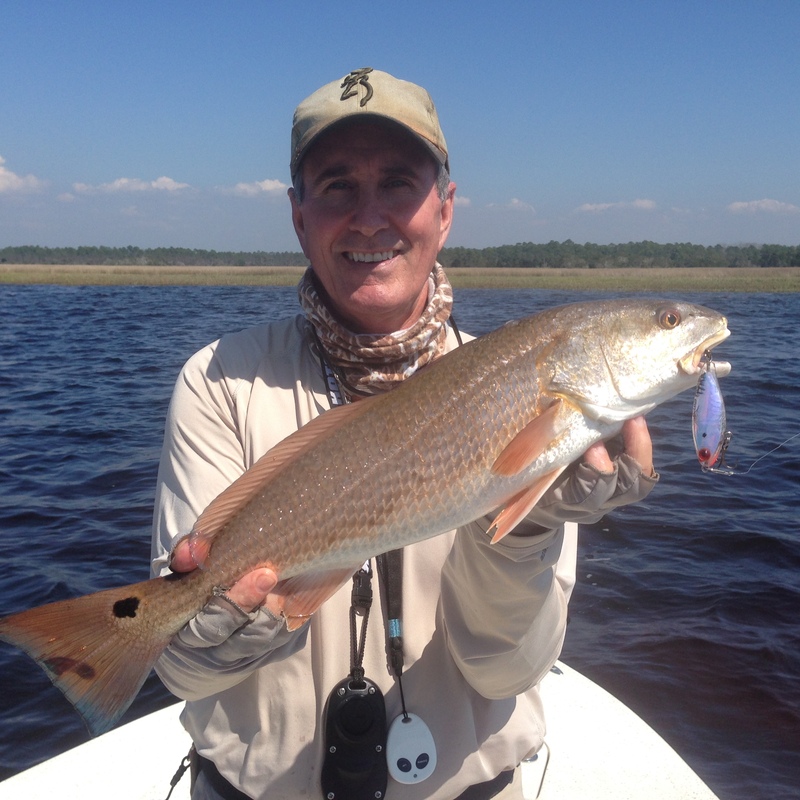 So far this spring I’ve found a lot more redfish when I’ve also noticed jumping mullet. I use binoculars frequently to scan the shoreline, just to look for mullet. 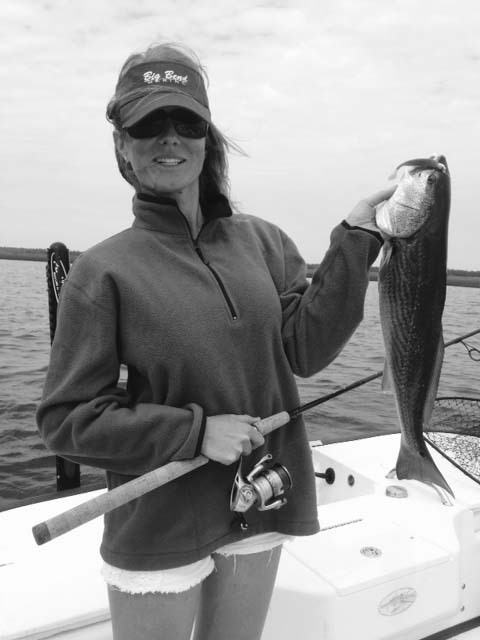 My assumption is that seatrout will move onto the flats in larger numbers in the next few weeks. 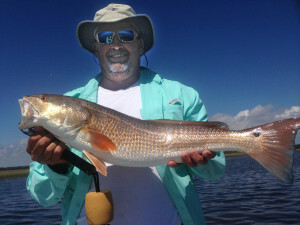 That will bring out the popping corks and Gulp shrimp, fished in 3 feet of water over mixed grass and sandy areas. What if they aren’t there yet? 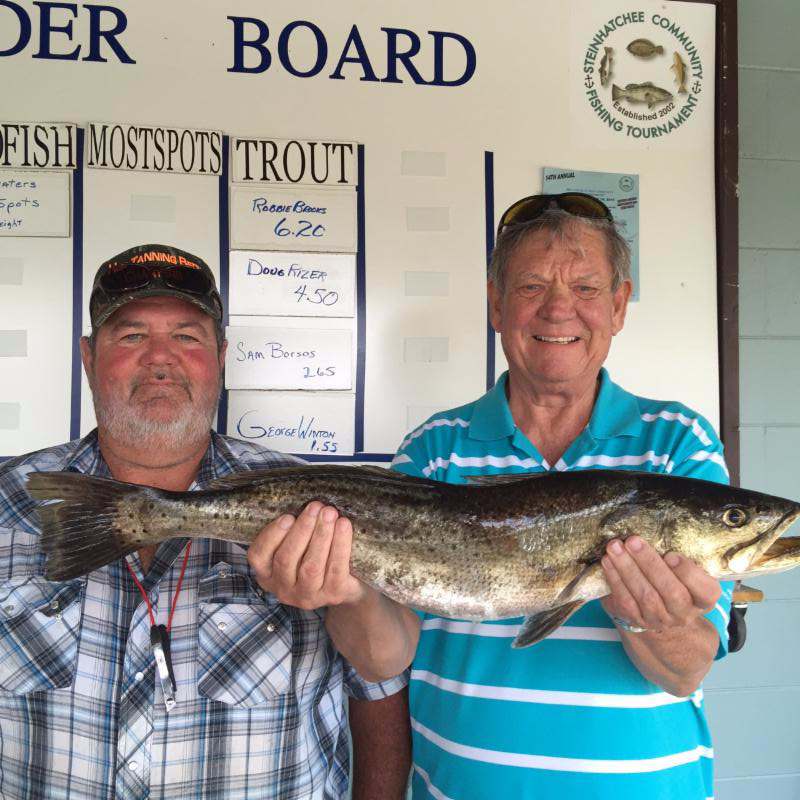 Further out, in depths of 4 to 6 feet, we are already seeing some nice silver trout catches (also known in our areas as sand trout). 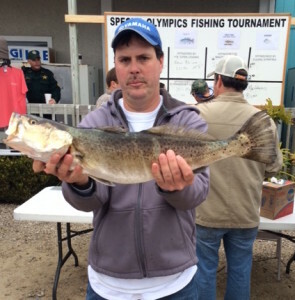 Sand trout have a lot going for them. 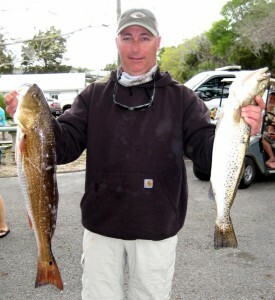 There’s no limit, they fight better than seatrout, and a lot of people like them better on the grill or in the fryer. Finding them can be problematic. Look for slightly elevated humps directly out from the Bird Rack area, or near any of the deeper offshore bars like Nine Mile Bank and Little Bank. Many times spotted trout will be mixed in with the silver trout, and when there are baitfish around, Spanish mackerel will join in the fun. 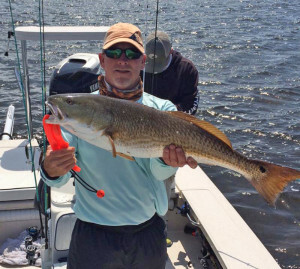 When you find a likely spot in the right depth, just drift for a while fishing small jigs and Gulp baits or shrimp pieces near the bottom. 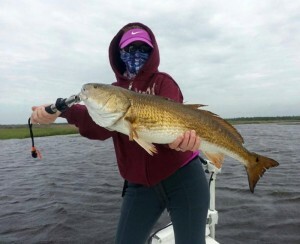 When you find fish, put a mark on your GPS and when the bite drops off, run back and repeat the drift. 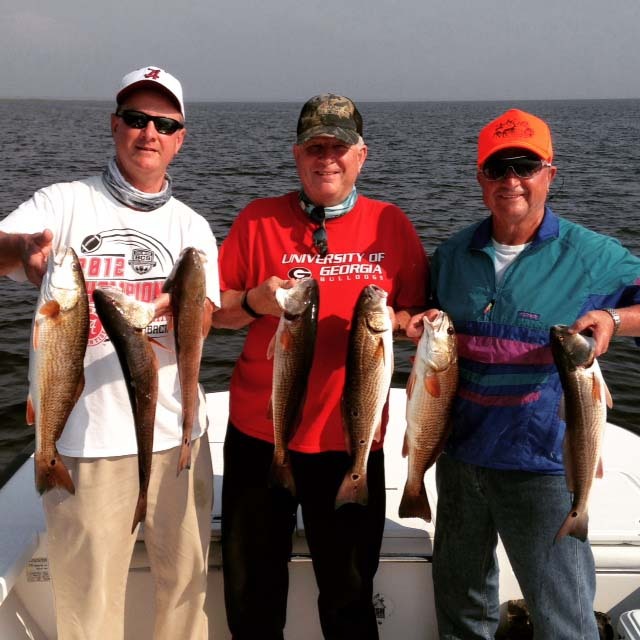 Sand trout can save a fishing trip when the bite is challenging, so it’s important to spend some time exploring to find areas that hold fish. 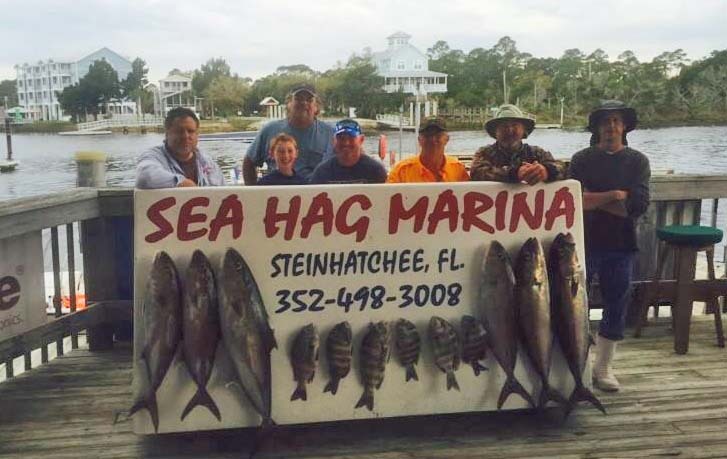 And as always, remember that the Sea Hag marina is the place to go for live shrimp, live pinfish, fiddler crabs, and all the tackle you need to catch fish in our area. 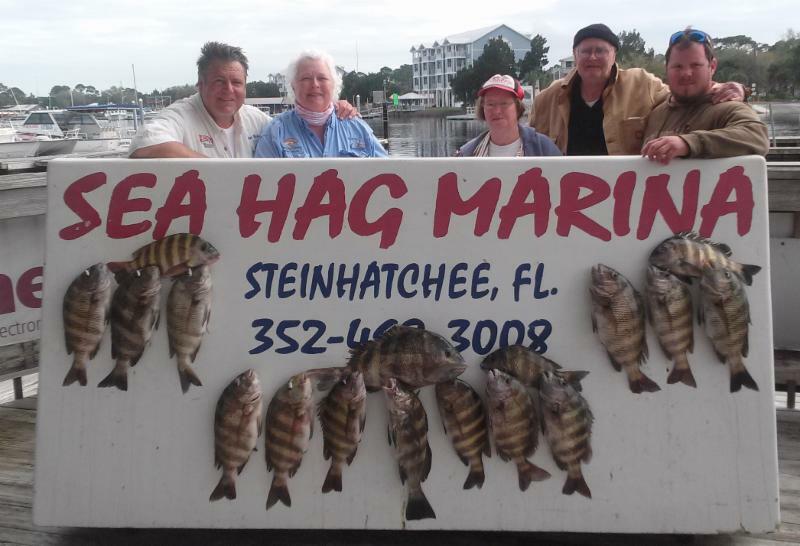 There are two Sea Hag events to put on your calendar for the month. On April 18th there is a motorcycle poker run to raise money for scholarships for Taylor County students. 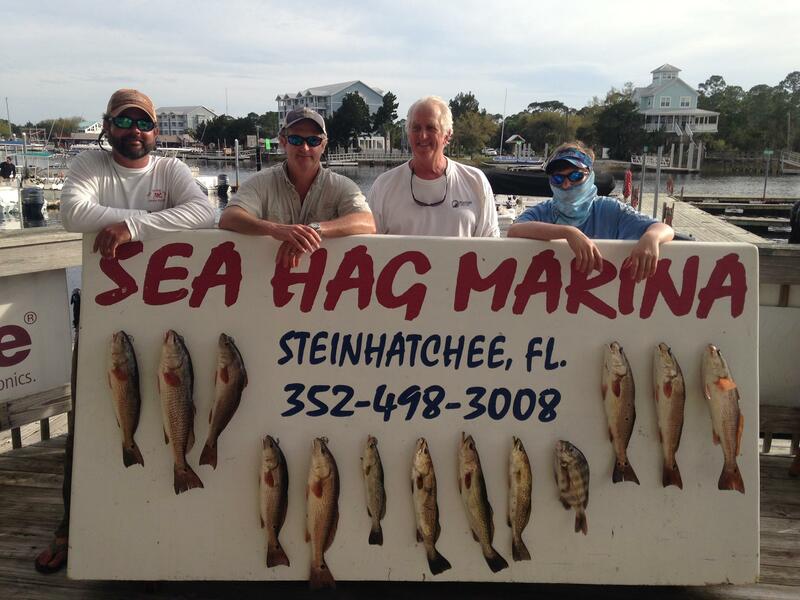 On the 25th, the Shands Fishing for Kids tournament returns to the Sea Hag with big prizes. Make your plans to participate in both these events. Spring break in April is a special time of year. I’m still as hot and bothered by spring just like when I was boy or in college. Spring turns me on. I remember as a boy tapping into a hot bed of bream or watching bass guard the sand saucer nest they fanned out by fin. I hunkered and hid for half an hour to watch the mommy bass without a thought of messing up what nature was rocking by me fishing her out of her reproductive saucer. While in college, I still thought about hooking-up. Sometimes it involved a fish. Sometimes it involved trying to hooking-up with something else. At either age period, I was more successful with fish. 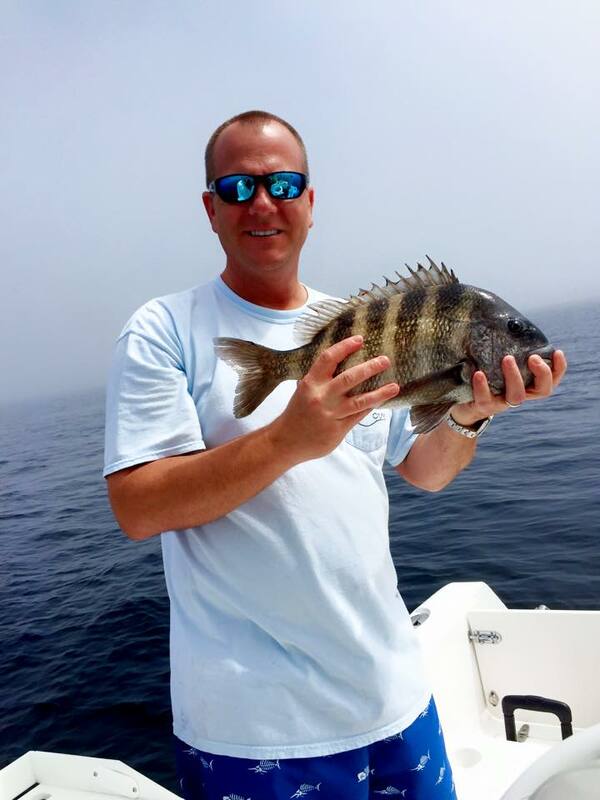 Now, by the bloom of the dogwood trees, I enjoy the darting solid tug of spawning sheepshead on light tackle. I best enjoy releasing the beer-bellied females full of the future. The swarm of hump-head seabass loving over a piece of hard bottom sucking down any bait before it makes it all the way down is an awesome way to experience a never-ending fish bite. The never-ending fish eating bite is also awesome at the dining room table. The sound of a spring rain from a pod of baitfish breaking the waters surface is exciting. It all happens in the early or late April. 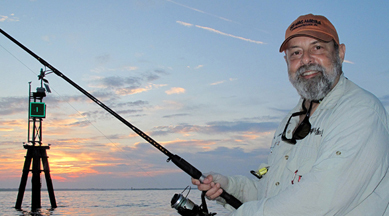 Ravenous Spanish mackerel, bluefish, trout, kingfish and/or something else looking for some fast action, is chasing those little hot tailed baits. Whichever, it is always a pleasure to be an involved in the reckless abandonment. Ah spring. I look forward to April. The month and I are connected by a lifetime of “Mono-Fulfillment”. 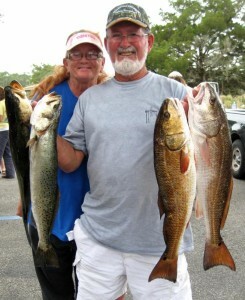 So, get you and the one or ones you love get on the water this month and spring together into a heap of happiness. 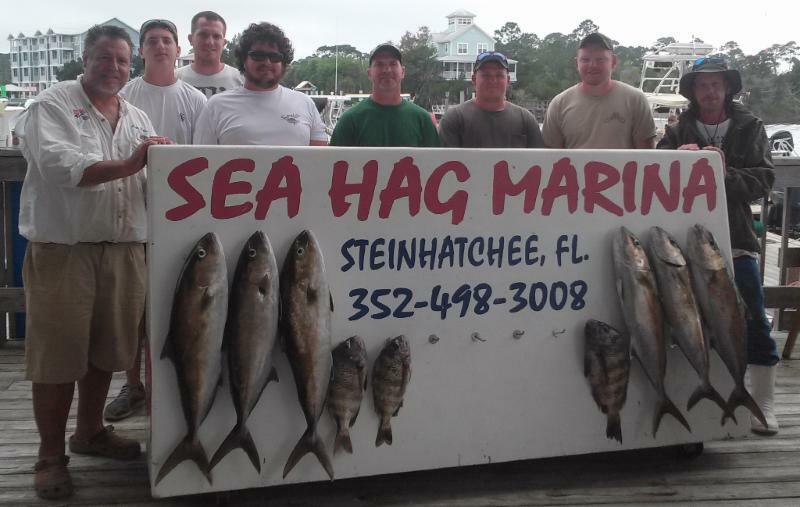 Steinhatchee is a hot spot to come get you some.